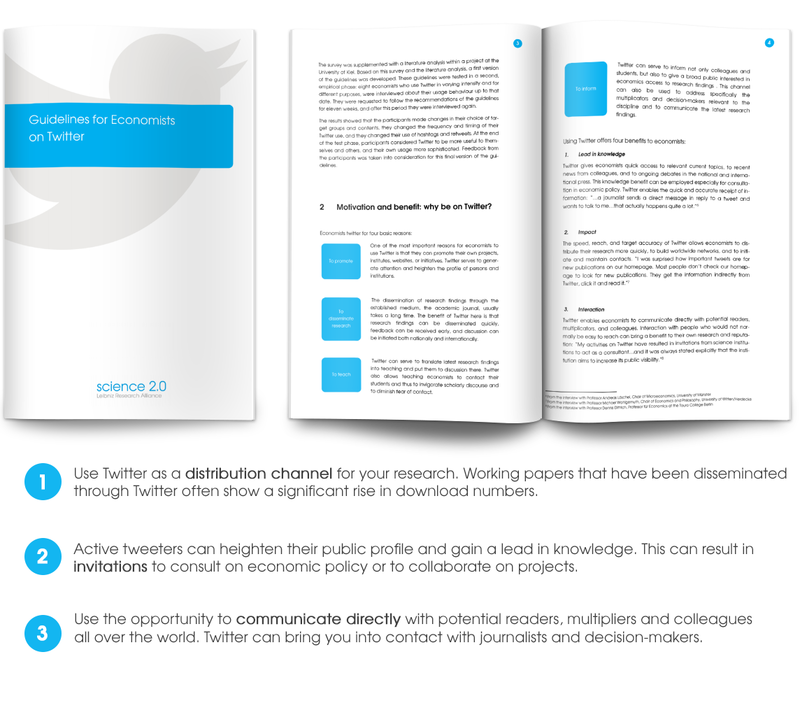 These guidelines for economists active on Twitter resulted from the research project Visibility for Researchers on the Social Web. They contain background information about the academic use of this short messaging service and practical tips and instructions to give researchers a quick and easy start or to optimise their previous strategy. How do economists achieve visibility on the Social Web? What does visibility/presence/influence in a social network mean? In order to answer these questions, economists already active on the Social Web were interviewed about their use of Twitter. Based on these interviews, the first version of the guidelines offered recommendations to researchers on how to improve their visibility on the Social Web. The document was submitted to a test group, accompanied by interviews and a test phase for the implementation of the guidelines. The findings from the test phase led to the present version of the Twitter guidelines. It is available in German and English language and can be amended collaboratively in a wiki.